Out-of-form striker Lukaku was dropped for United's victory over Everton 10 days ago. Mourinho explained Lukaku's absence from the squad that beat Bournemouth 2-1 at the weekend was down to an injury sustained last week and said the forward would be assessed following the game at the Vitality stadium. 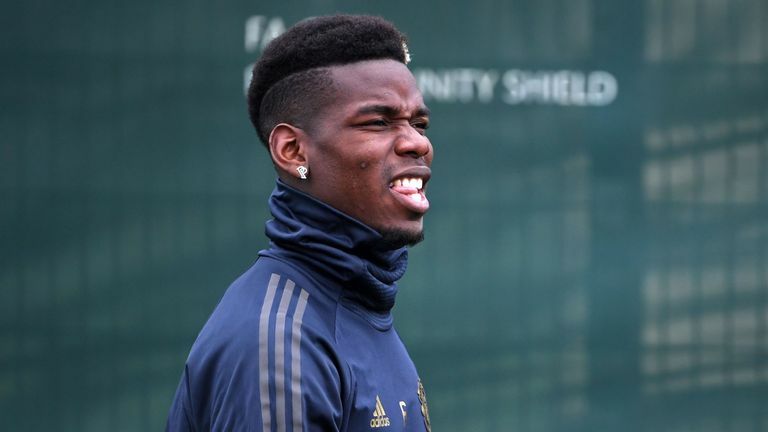 There was some contrast in Pogba's entrance to United training from when Sky Sports News cameras captured a frosty exchange between the pair in late September, which followed the player being stripped of the vice-captaincy. Marcus Rashford also gave Sky Sports News reporter Vinny O'Connor a demonstration of his shooting practice. He aimed a long-range kick which caught O'Connor during the reporter's live interview on Sky. Watch that and Mourinho's warm reception for Pogba by clicking on the video above.